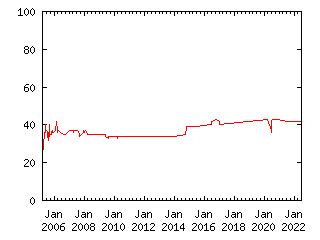 This is a scaled claim that pays $0.01 for each 0.02C by which the globally averaged surface air temperature averaged over the 5 year interval 2028-32 exceeds the temperature averaged over 1998-2002. If the temperature in 2028-32 is no warmer than 1998-2002, the claim pays $0, and if the temperature is more than 2C warmer, the claim pays $1. Note: Globally averaged surface air temperatures are currently available from NASA GISS at http://www.giss.nasa.gov/data/update/gistemp/ . The temperature in 1998-2002 was 0.56C warmer than the 1951-1980 baseline. Note: Globally averaged surface air temperatures are currently available from NASA GISS through http://www.giss.nasa.gov/data/update/gistemp/ , with a table of values at http://www.giss.nasa.gov/data/update/gistemp/GLB.Ts+dSST.txt . The temperature in 1998-2002 was 0.44C warmer than the 1951-1980 baseline. As of August 2009, the table of globally averaged surface air temperatures could be accessed through http://data.giss.nasa.gov/gistemp/tabledata/GLB.Ts+dSST.txt, the main page being at http://data.giss.nasa.gov/gistemp/.